A budget hole amounting to $11.6 million has appeared in the Department of Internal Affairs' (DIA) Common Capabilities programme of shared ICT services. DIA has told Parliament's Governance and Administration Committee that the division faces long-term cost pressures in four areas including in Common Capabilities, a set of ICT services which are procured once by DIA for the benefit of other agencies. The programme was forecast to break even from 2021, however DIA said new projections indicate break-even will not occur due to increased costs of operation and service fees. Furthermore, the projections also indicate future revenue for a number of products will be reduced due to changes in agency demand and maturing of offerings. Specifically, costs are projected to rise due to the development and operation of an ICT services marketplace; a digital channel for procurement directed by cabinet and the reopening and additional security certification for Telecommunications-as-a-Service (TaaS), which is the largest all of government capability. "This has been raised with The Treasury to progress a sustainable solution while continuing to realise the direct (circa $100 million a year) and broader benefits from the common capabilities approach," DIA said. Common Capabilities include TaaS; Infrastructure-as-a-Service (IaaS); information technology managed services (ITMS), enterprise content management as-a-service (ECMaaS) and Desktop-as-a-Service (DaaS). The services allow agencies to share ICT investment and pool resources, reducing duplicated investments and allowing costs to be shared across government. DIA in turn receives service fees from consuming agencies set as a percentage of their consumption. Most of the savings come from better pricing through the government acting as a single customer. Update: In response to this article, Tim Occleshaw, deputy chief executive of service and system transformation and deputy government chief digital officer, said the all of government common capability programme met Cabinet’s target of achieving sustainable savings of $100 million a year by 30 June 2017. The amount achieved for the year to 30 June 2017 was $107 million while the total accrued over the programme to that date was $292 million. The balance of the common capability account relates to the ongoing management of these capabilities and is three per cent of the savings achieved by the programme to 30 June. 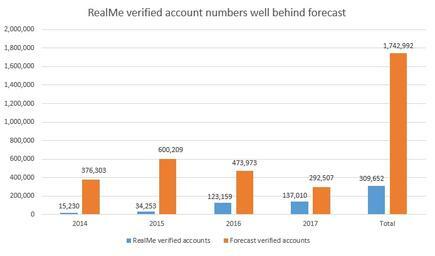 Meanwhile, the DIA has also released new numbers for the uptake of its RealMe identity verification service, showing that the number of verified account registrations remains well behind 2011 business case forecasts, as outlined via the chart below. The business case projected 1.7 million verified accounts but only 309,652 had been achieved by the end of the 2017 year. According to the DIA, as of 31 January 2018, the number of verified identities had grown to 397,472. A RealMe verified account occurs when a customer has their digital identity linked to their RealMe log in enabling them to prove who they are online. DIA said uptake volumes were lower than expected because key anchor tenants did not integrate to RealMe as early as anticipated in the business case. The number of services using the RealMe identity verification has continued to grow with an additional four services being integrated during the year to 31 January 2018, which brings the total integrated services using the RealMe identity verification to 15. The number of services using the RealMe login service has also increased, with an additional 10 services integrated during the year, bringing the total number of integrated services using RealMe login to 103. In addition, the number of RealMe logins created is almost 3.8 million, with peak use running at 1.4 million logins per month. According to the DIA, a number of initiatives are currently underway to increase the uptake of RealMe services. For instance, the New Zealand Transport Agency (NZTA) is implementing an online driver's licence renewal using verified identity, due to go live on 1 July 2018, subject to licensing riule changes - 300,000 such renewals are processed a year. 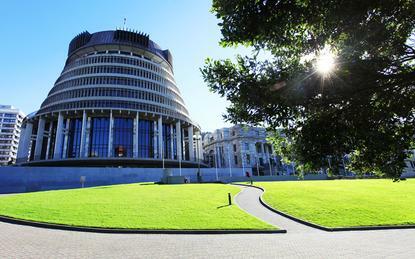 Photos collected as part of the RealMe identity verification process will be able to be provided to NZTA to be printed on the driver's license. DIA said there is widespread interest in use of the verified photo, made possible as a result of amendments to the Electronic Identity Verification Act, which include professional registration and identity card processes, such as for students. Major banks BNZ, ANZ and Kiwibank are integrated with RealMe, with Westpac currently being integrated. The DIA is also developing an app called RealMe Now designed to allow applicants to verify their identity and obtain a RealMe verified account using a mobile device.